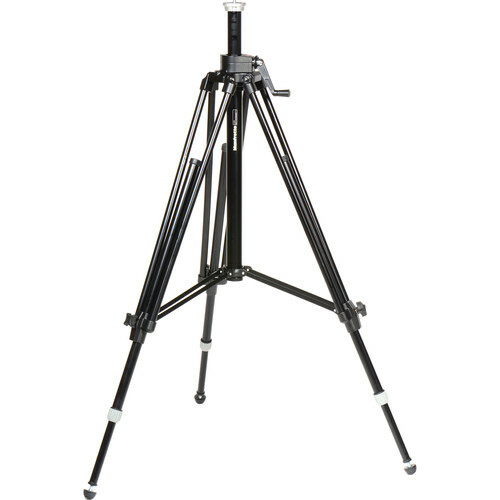 The Manfrotto 028B Triman Camera Tripod is a strong, sturdy tripod with a geared center column built for industrial and studio applications. Standard features include the tandem leg design, built-in bubble level, and rubber feet with retractable spikes. The geared center column has a non roll-back feature and has a threaded 3/8"-16 mount on the bottom of the column to allow low-angle shots. Strong enough for even the most ardent of medium format applications. The 028B is compatible with the 181B dolly. A mid-level spreader and a carrying strap are included with the tripod. Box Dimensions (LxWxH) 33.75 x 7.0 x 6.75"
028B Triman Camera Tripod with Geared Center Column is rated 4.8 out of 5 by 80. Rated 4 out of 5 by Call me Nighthawk from Great travel tripod, if you're the hulk! What's up fellow camera fiends? Hope you're all having a great day! I just received my Manfrotto 028B Studio Pro in the mail and let me tell you it is an impressive piece of kit. The legs are very solid and feel like they could take a beating better than Tito Ortiz in his last fight. The only drawback I can see is the weight. Obvioulsy it's not a problem for me due to my super strength, but normal humans would probably find it combersome to carry for long periods. This is definately a studio tripod. It does come with a strap/sling in case you have to carry it from storage to the studio, which is nice. All in all, I found this tripod to be very satisfying. Rated 5 out of 5 by WomanWatcher 1 from Benefitial Height My other tripod is not equiped to extend in height. I was convinced to build a platform to film an event that did not include a stage of any kind. I knew that B&H provided the Manfrotto 028B Studio Pro Triman Tripod Legs that has a crank to extend the neck, along with extra leg extentions to extend over seven feet in height, which, with the head (501HDV Pro Fluid Video Head) and Camera (Sony Digital Handycam DCR-vx2000 NTSC), and necessary attachments, to extended another foot. Eight Feet is enough height to film above heads and make a presentable presentation to make a Five Star DVD of most any event. Now, there is no need to build a platform. Thanks for listening. Rated 5 out of 5 by John from Very Sturdy Very sturdy tripod. Rated 4 out of 5 by Anonymous from Best value for the height I bought this tripod for its height and use it as a supplement to my shorter (but faster to setup) regular tripod. There aren't many 8 foot tripods, and for the money this is a good buy. My other experience is with Manfrotto's 9 foot behemoth, which while very stable is overkill for most cameras today (supporting nearly 50 lbs) and so it is costly. Despite the thin looking legs I've found this to be very stable. It's not very fast to set up or take down - I wish the center column had a quick drop mechanism - but for a solid set of tall legs, this gets it done. Rated 5 out of 5 by Anonymous from Solid, reliable, pro-spec legs Great product for use in documentary film-making (with a lot of running around, travel, and remote location work) and corporate productions. I use this with Sony PMW-EX1 and HXR-NX5U cameras and a 503 Manfrotto head. Very good, easy to manage leg height adjustment, an included spreader that does not stick when opening, and a smooth crank handle for those rare times when you just have to raise that center column a few inches. Tough construction (few plastic bits, thankfully), and quite comfortable to carry over a shoulder for hours at a time (if you must). Rated 5 out of 5 by Red Fern from Rock solid Though this is meant as a heavy studio tripod, I bought it to use as a sturdy base for a portable astrophotography setup. I needed it to support up to 20lbs of equipment that would be rotating on a gear, and couldn't move a millimeter. And I have to say, as long as there was little to no wind, this worked perfectly. Very pleased with it, though I would recommend using it for applications where you won't have to carry it much, as it is very heavy. If you know that going into it, though, then this is a highly recommended base. Rated 5 out of 5 by JUNEBUG from Every professional should have one! I use the Manfroto 028B Triman tripod(3) to support my Nikon D610(3). This tripod is a professional grade, sturdy, and reliable. What I like about it most is its fully extended height which put me & my cameras 8ft. above ground level which is well above the heads of any crowd I have encountered at a concert and other live events. When you're being paid to capture a moment, you can not afford to have someone walk through your frame. I have 2 028Bs with Manfroto 3063 fluid motion heads for video, and 2 028B with a MXHPRO 3W head for portraits, however it moves so smoothly that I sometimes use this one to shoot video also.